Thanks Inge Scherer for this great exmple of the Xerox 820-II with expansion cabinet. This CP/M based system did not borrow much from Xerox' illustrious history of creating some of the first graphical networked computers such as the Alto and Xerox 8010 Star. 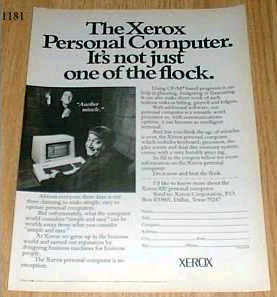 Instead it was Xerox' answer to getting a microcomputer system into the market and therefore used the popular CP/M operating system. Another CP/M-based system developed by Xerox was the 860 IPS. The only thing that is visibly from Xerox' workstation heritage is the design of the keyboard which shows some of the ergonomic touches of the Xerox 8010 Star. Note that most of the computer innards are built into the monitor, and there is no separate CPU cabinet (although ours came with a third party expansion cabinet). 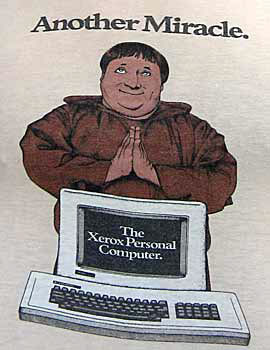 Xerox' ad campaign for the 820 featured a group of monks in a monastary and the memorable "another miracle" ad and t-shirt (see below). The Xerox 820 was an 8-bit desktop computer sold by Xerox. The computer featured floppy disk drives for mass storage, and used the CP/M operating system. The design of the microprocessor board was a licensed variant of the Bigboard computer. It used a Zilog Z80 processor clocked at 2.5 MHz, and boasted 64 kiB of RAM. The Xerox 820-II followed featuring a Z80 processor clocked at 4.0 MHz. An updated version of this computer called the model 8/16 ran dual CPUs, Z80 and Intel 8086, which could be booted jointly or separately. The software for it was CP/M 80 and CP/M 86, plus Wordperfect and Dbase II. It featured a double 8" floppy disk drives, a 12" b/w monitor and a Daisywheel printer. Later in 1984 double 5.25 floppy disk drives, a portrait size blue monitor, and a laser printer were offered. It's not just one of the flock." Got something to tell us about the Xerox 820? Contact us!